Disclosure: I received several promotional items and compensation as an official Mom’s Week Event blogger. All opinions are 100% my own and may differ from yours. I will only endorse companies, products and services that I believe, based on my own experiences, are worthy of endorsement. I am thrilled to be an official Mom’s Week blogger. The start of Mom’s Week is even more special for me because today his my mom’s birthday! Happy Birthday, Mom! 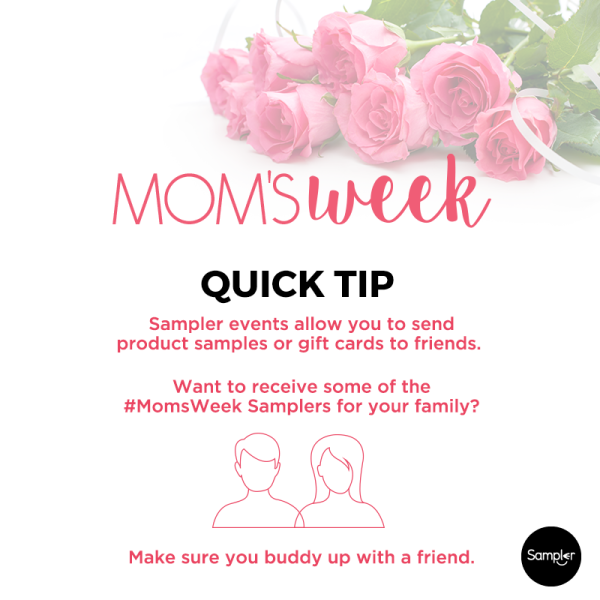 Mom’s Week is a week long event where I, and four of my fellow bloggers, will bring you incredible Sampler events and Flash Giveaways for some great products just for moms! Products to pamper mom and make her life easier, because we want to celebrate all moms and all they do. 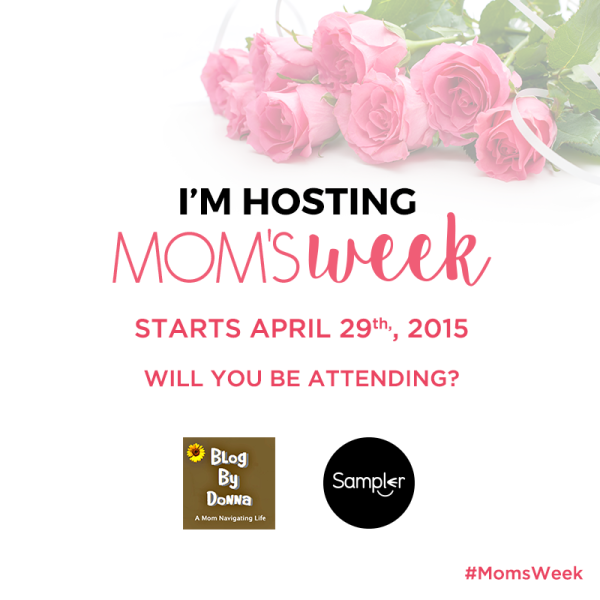 Mom’s Week starts today with an RSVP to Win contest…. This contest will be hosted on the Sampler page starting today, April 29th and YOU DO NOT WANT TO MISS OUT ON IT! So I encourage you to RSVP… you will be glad you did! You have a chance of winning an incredible gift basket just for RSVPing! What’s in this gift basket you ask? Well, let me tell you…. By RSVPing you will get access to the official Mom’s Week calendar where special links to each giveaway and sampling event will be behind each logo on the calendar. This is very important considering it will show you when all the events are taking place. You only RSVP once, and you can do so on a tab installed on the Sampler Facebook Page. Note: You can only RSVP once. After “RSVP-ing” you will receive exclusive access to the calendar and will have a chance to go and “Wish For” the product samples you would like to receive. Be sure to go wish for some offers. Personally, I’d want to receive/ “Wish For” – Kiss My Face, Grab Green, and Basq. Oh, and Skoy Cloths (okay, I want everything). Mom’s Week gives you the chance to send the moms in your life products and gift cards from the best brands. And if you want to receive one for yourself, you can share the promotion so all your friends know. Skoy provide products for the kitchen that last a long time, saves both money and the environment. They also bring fun into cleaning with cool and unique designs! 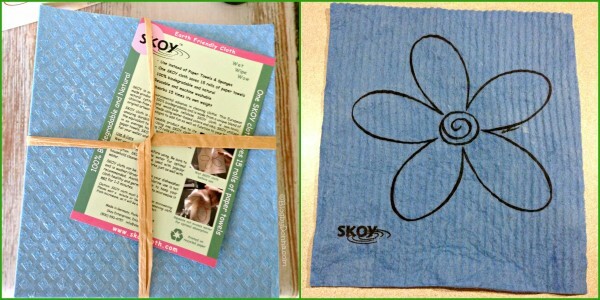 I love using my Skoy Cloths. They’re so absorbent, and I am thrilled to not have to throw away money on paper towels. I put them in my dishwasher every time I run it to clean them and they’re ready to use the next time I need it. Grab Green carries a line of detergents that are not only safe, but effective. The first in the industry to list every ingredient on the label, Grab Green offers toxin-free formulas that get the job done. I’ve been using the 3-in-1 Laundry Detergent pods and I’m impressed with how clean our laundry is, but that there are no harmful chemicals and toxins being added to our clothes that could further irritate my contact dermatitis. The Grab Green Dishwasher Detergent pods are my favorite, though. My dishes come out sparkling clean and the kitchen smells like tangerine with lemongrass. Montagne Jeunesse has been around for 30 years and have always been eco-minded using vegetarian, natural, and cruelty-free ingredients. I love their Treat for Feet and face masks. New England Natural Bakers make healthy and delicious granola snacks that are all-natural and organic, in New England. My husband and I love granola, and take it on hikes with us often. We add it to yogurt all the time, too. My favorite is the Cranberry and Almond Granola. You can taste the all-natural goodness in every bite. Soapbox I’m excited about using Soapbox Acai Berry Oil Shampoo. My hair is dry and can use the extra moisture. My favorite thing about Soapbox Acai Berry Oil Shampoo is that it is sulfate and parben-free. It’s truly good for you hair. It smells great, too. Their slogan says it all… “good. clean. hope.” When you purchase a soap, you donate one month of clean water. 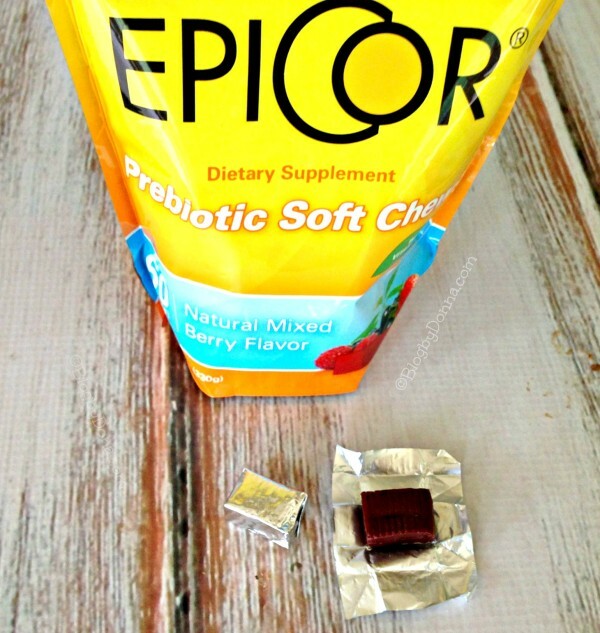 EpiCor is an immunity boost. Something a busy mom like me needs. I’m so busy that I don’t always take care of myself like I should, so I could use Fermented foods are beneficial to our health. I need to build up my immune strength. I want to live a quality of life, a healthy life, a long life. A prebiotic can help me achieve a stronger immune system. Genesis Today carries a large line of supplements that meet many different needs. From beauty to detoxification, to digestion and rest and relaxation. They specialize in super foods and get them from the source. Whether it’s India, Asia, or any number of exotic locations. Our bodies lose collagen as we age, sad but true. Renew Alliance is a liquid that is ingested, so it acts faster to repair skin damage, working from the inside out. 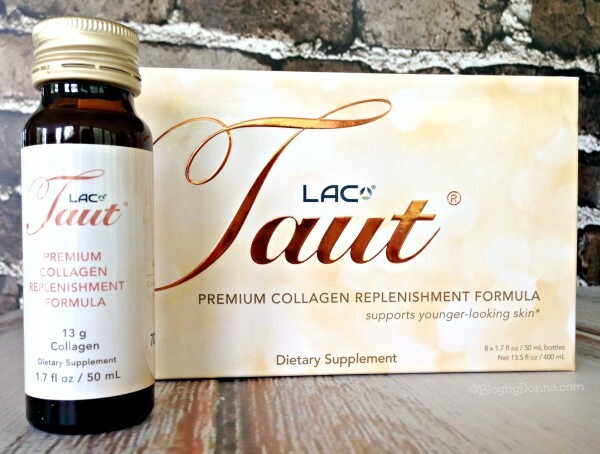 I’m looking forward to taking Lac Taut at night and seeing the results. EZ Melts are fast-acting dietary supplements that you can take anywhere since they dissolve in your mouth without needing water. No more chalky tasting supplements or swallowing large pills. Basq products are manufactured in the U.S. All basq products are Clinically Tested to be allergy, irritant and sensitivity free. And we never tested on animals! 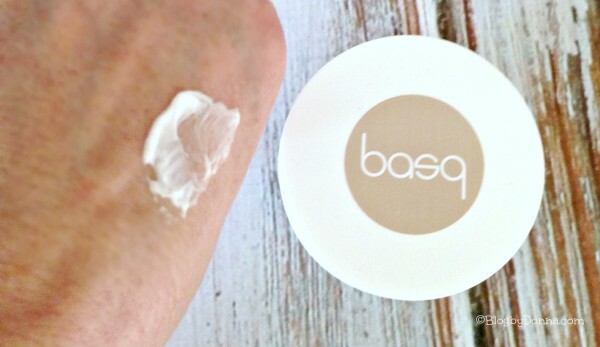 The Basq Illipe Body Butter is a rich creamy moisturizer that leaves your skin feeling smooth, soft, and hydrated. Kiss My Face is a company dedicated to respecting our earth. They have a large line of skin care products and right now, I’m craxy about the 2n1 Lavender Shea Light Moisturizing Air Powered Spray. 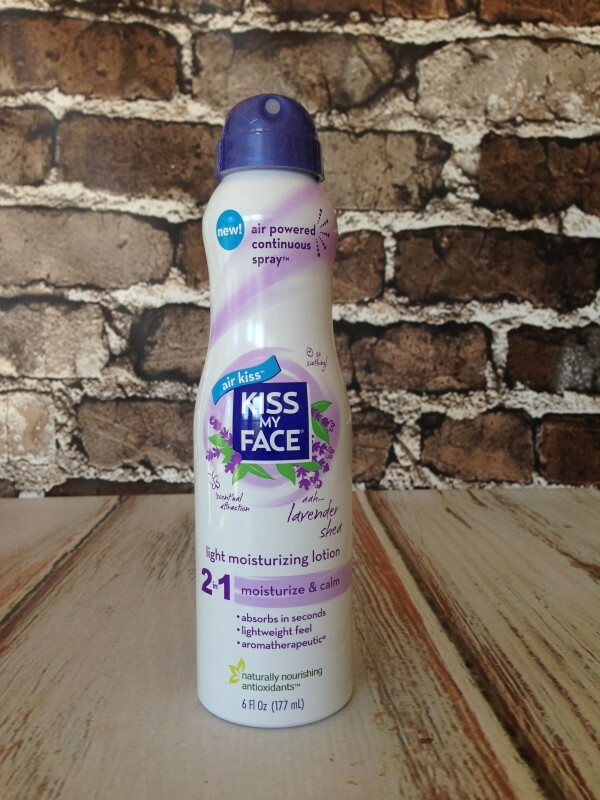 I like a spray, it’s not as messy and provides a lightweight feel. I love the light scent of lavender, especially when I use it right before I go to bed… it helps me to relax. Charlie’s Soap’s are made up of raw materials that can be separated into two categories, biodegradable ingredients and natural mineral ingredients. They were also rated safe to use around lakes and streams. I need my laundry detergents to clean our clothes, but I also want a detergent that is gentle and non-toxic. Charlie’s Soap fits the bill. I love all of these brands for providing quality products that are environmentally safe and toxin-free, so I can feel good about using them in my home and around my son. Sampler partners with your favorite brands and gives you the chance to send product samples or gift cards to friends via Facebook. Also during the week of May 4th — May 8th there will be a flash giveaway each day. I’m not going to divulge what the prizes will be (and it’s really hard to keep it a secret because the prizes are AWEsome) because I want to keep them a surprise. My flash giveaway will be on May 7th and I’ll share more about it soon! My fellow Mom’s Week Event bloggers will also have a flash giveaway the other four days are, so stay tuned! Gain access to the full calendar of Sampling and Flash Giveaway Events. The calendar will give you direct links to the events. I’m really excited about Mom’s Week and sharing samples with my own mom. And super excited to see our fans winning some incredible prizes during the event! You can follow along with us on social media using the #MomsWeek hashtag. So many great ideas for gifting mom. Thanks for this informative post! This is a great gift basket! My mom would love it! Great gift ideas and fantastic prizes. Thanks. I have been meaning to get a Skoy cloth for a while now. You have lots of great ideas. This is one of these biggest giveaway events I’ve seen. There is so much stuff here, and flash giveaways are the best! Thanks! I am so entering this! I can’t believe the sheer amount of swag going on in this giveaway. Thanks so much for sharing this with us! Awesome gift basket! I’ll be back for the sampling event! I rsvp’d and hope I win. That is an awesome prize basket. Thanks for sharing the info. This is so exciting. That gift basket has so many awesome things in it! So many awesome products! I love Charlies such a great product! This will be a fantastic gift basket! What a great group of items. We already use some of them and I would love to try out the other ones! Thanks! Woah, now THOSE are prizes! It sounds like a blast, I want to come! That’s so wonderful you’ll be doing this for moms all week long. I think moms are spectacular and deserve a little something like this every now and again! 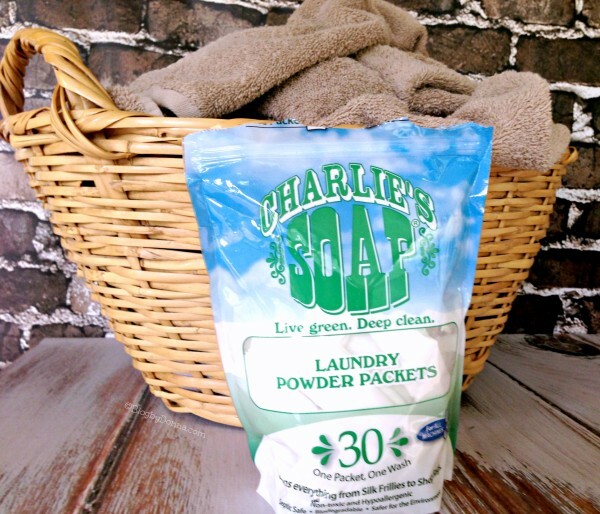 Great list of items… we currently use Charlies Soap as our main detergent. LOVE IT! What an outstanding prize lineup! I am definitely intrigued by that spray lotion and there are so many brands involved that I have yet to try. I love Soapbox! Their products are great and smell amazing! So many great products. I would be happy to try any of them! Wow, there is some incredible stuff in this giveaway! Looks fantastic!! I’d like to try the pods. I like those so much better than powder or liquid detergents for the laundry. What a fantastic giveaway, such great prizes. Thanks for hosting! Wow, what an amazing event! Moms do so much so it’s nice to see all of us getting celebrated – for a full week! The New England Natural Bakers sounds wonderful! I love they are Non-GMO/Organic!